Three runners for the stable on Saturday with Loyalty Man staying home at Flemington and Strike Force and Pedro Ximenez heading to Geelong. Loyalty Man (pictured) is in race one, the 3AW Trophy over 1600m with Patrick Moloney to ride and jumping from barrier two in the small field of seven. It will be the third run this preparation for the six-year-old. “I think the rain has helped us by taking the jar out of the track and I couldn’t be happier with the horse,” Mike Moroney said. “He’s going into the race in great order, he’s fit enough and the small field should help with no traffic problems. At Geelong, Strike Force runs in race, the Ballan Cup over, while Pedro Ximenez is in race four, the Benchmark 70 Handicap over 2240m with Rhys McLeod to ride from barrier three. Jason Benbow is aboard Strike Force, drawn barrier two in the seven-horse field. “The give in the track is certainly in his favour and from the draw I think he’s a great winning chance,” Moroney said. It will be the third run this preparation for Pedro Ximenez and Moroney is confident the son of High Chaparral can run well. 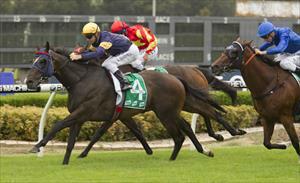 “He’s had the two runs and this the first time he goes to the races with a winning chance,” Moroney said.